I had far too much fun making this. I got my friend Mike F. (who is a Mormon and was raised to not use naughty words, and also has probably done more with his life than me or most of my friends) to write a bunch of nonsense to put in the speech bubbles (and in one notable case in a sound effect). It would be much later that I would attempt any sort of plot, with mixed results. Neko Machi’s first but not last flirtation with color. The idea of doing fanservice with the Neko Machi cast was weird since they’re based on me and my friends, plus that kind of thing is hard to draw. Kitty’s younger sister (who I eventually named Ruby) is based on my younger sister Debbie, who does like mooses in real life to this day. 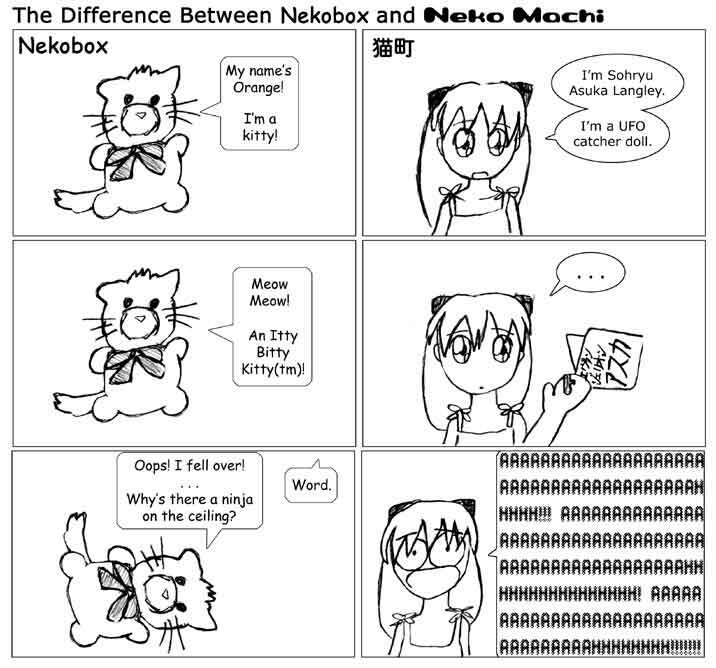 I think this was a jab at Megatokyo or something. 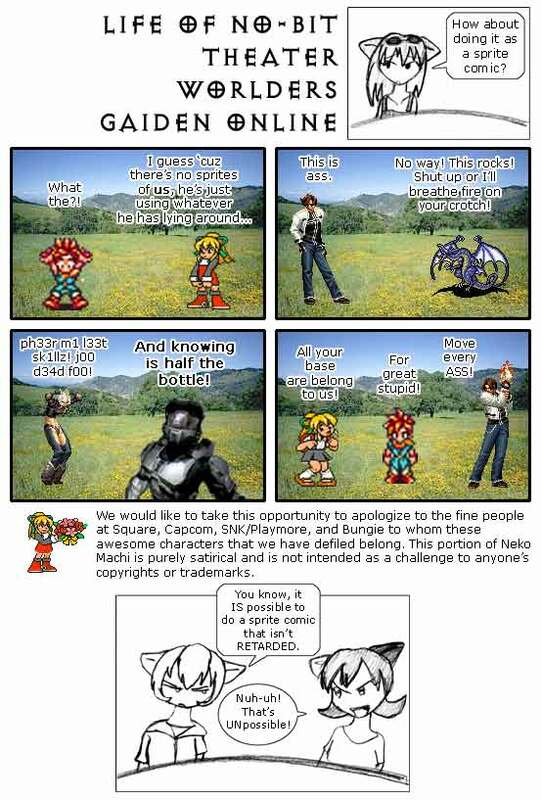 Sprite comics sure were a thing. There were some with actual substance, and a whole lot that didn’t. L33t was a thing too. I can’t say I miss it. Ken was based on a friend named Ken (short for Kentaro), a generally really cool guy. That he had a delusion about being a cat-person when he was biologically a dog-person was his idea. And then Jezebel/Dora, making her first properly canonical appearance, sorta. Michelle (who was based on the aforementioned Mike F.) joins the cast too because I don’t know shut up. 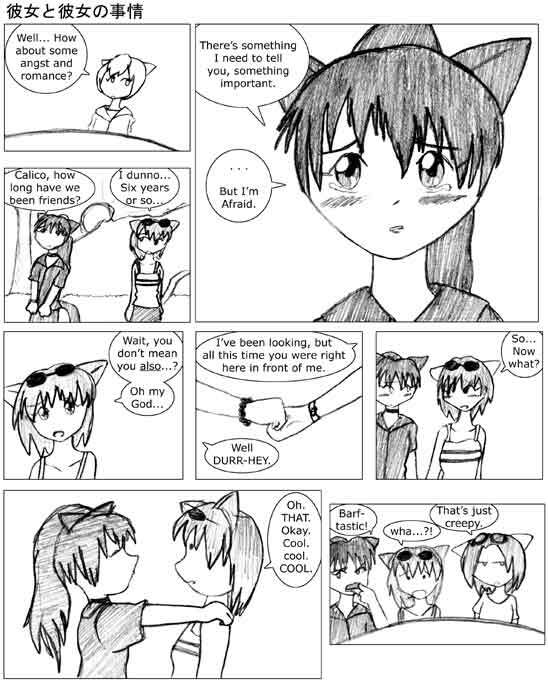 And then Jenny (of Daisy’s Dose of Wisdom fame) became a catgirl named Sunny. I’d say she’s mellowed out somewhat, but the name “Sunny” was entirely fitting. An email I received from a fan. I guess. I’m pretty sure the clip they’re talking about is this thing, where some decidedly male fans did a live action rendition of the Card Captor Sakura opening theme. My friends said that if I ever went insane they’d probably find me doing stuff like this. Michelle/Mike F. (who was based on the aforementioned Mike F.) had a really amazing and spontaneous sense of humor. This is a random thing he came up with out of nowhere one day. I still hope this was taken in the affectionate way it was originally intended. Neko Machi did kind of wind up being the weird, dark twin of Nekobox (the site was even colored purple where Nekobox was orange). I forgot how badly I ran that one into the ground.